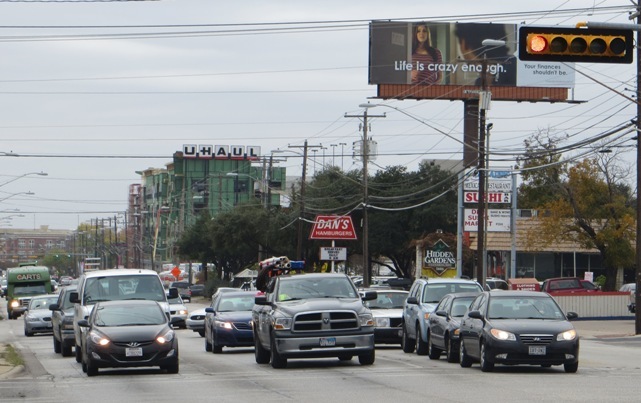 North Lamar traffic (several blocks north of the Triangle). 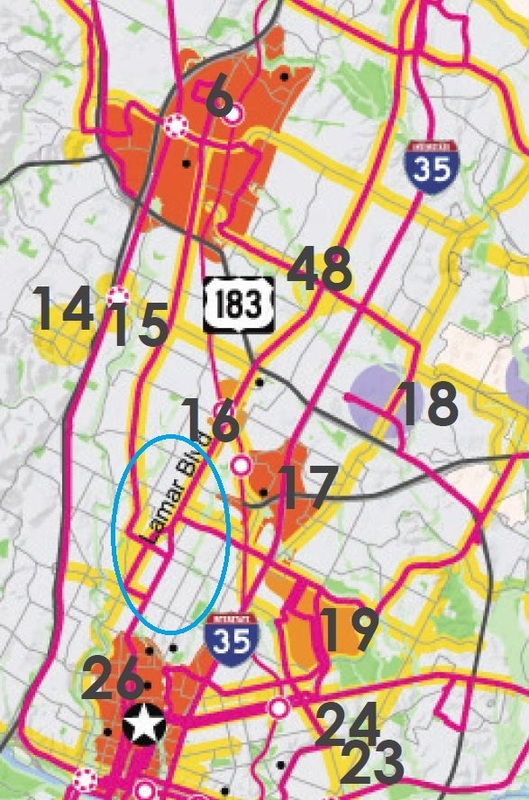 Guadalupe-Lamar travel corridor carries heaviest traffic flow of any local Central Austin arterial, serves residential concentration ranking among highest density in Texas, serves 31% of all Austin jobs — yet corridor was “dismembered” by Project Connect and excluded from “Central Corridor” study! Photo: L. Henry. The following post has been slightly adapted and edited from a letter posted by the author to members of the Central Corridor Advisory Group (CCAG) on December 6th. Later that day, CCAG voted 14-1 to endorse Project Connect’s official “ERC-Highland” recommendation. 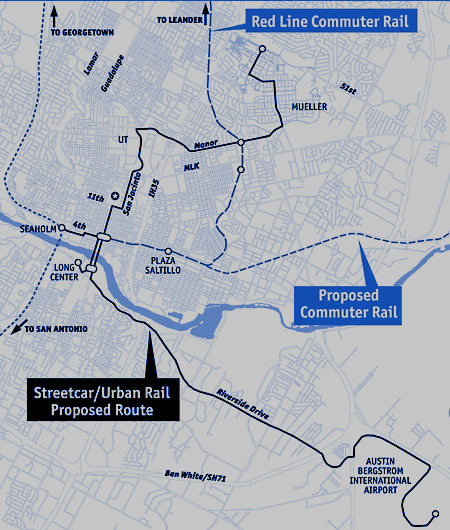 Eighteen months ago The Texas Association for Public Transportation (TAPT) offered a comprehensive urban rail plan to the Transit Working Group and to CAMPO that largely fulfilled most of the goals public officials said they wanted from a phase one project. 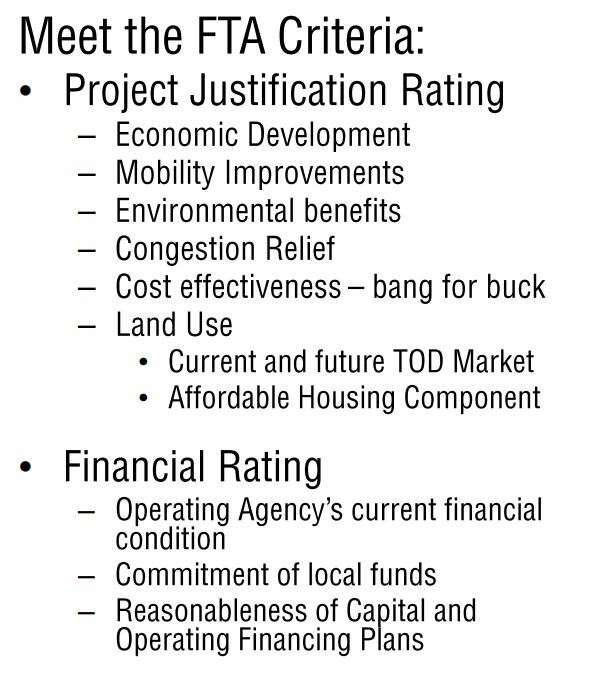 During the last two years of TWG meetings, it became clear that phase one urban rail would need to meet a constrained budget between $275 and $400 million locally that aimed at a 50% federal match for a total project cost of $800 million or less that included Mueller. The most important elements to reach that goal are summarized on page 42 of the Urban Land Institute’s Daniel Rose Fellowship presentation made at Austin City Hall, Friday February 22, 2011. Rather than take a presumptive speculative sketch-planning approach to what might be 17 years from now, somehow somewhere in the city, TAPT’s plan relied on reality, decades and tens of millions of dollars of past rail planning that culminated in the comprehensive detailed 18-month long Federal Transit Administration (FTA) sanctioned and funded 2000 Preliminary Engineering/Environmental Impact Study (PE/EIS) that forecast 37,400 riders on the Guadalupe-Lamar corridor in the year 2025. 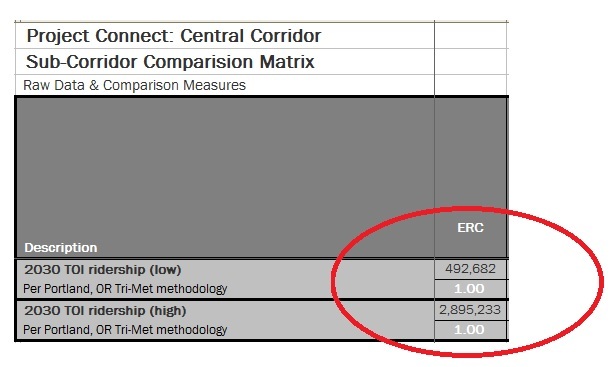 Compare that number to Project Connect’s year 2030 forecast of 2.9 million daily [transit] riders in the East Riverside Corridor (ERC). This is more daily [transit] riders than [in] any US city except New York. Even the low 2030 ERC forecast of 492,682 riders daily is 17% more daily riders than San Francisco’s 104-mile BART heavy rail system, one of the best rail systems in America. As Mr. Keahey explained at last Wednesday’s [Dec. 4th] Alliance for Public Transportation meeting, a PE/EIS goes way beyond and is far more detailed than the kind of planning his team is currently engaged in, and as a transit [professional], I concur completely. Excerpt from infographic in Project Connect’s Map Book v. 5. 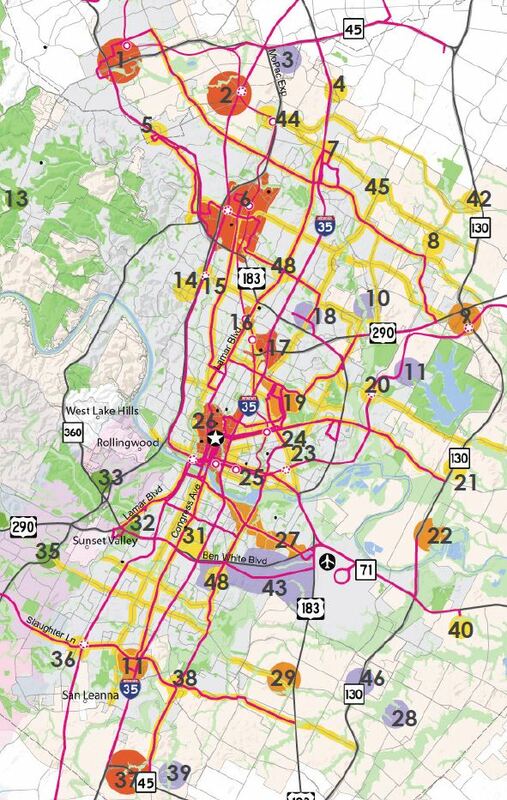 Data presented shows Austin’s highest population density clustered around West Campus-Guadalupe-Lamar corridor — but this travel corridor was omitted from Project Connect’s study! Green line on Lamar-Guadalupe represents MetroRapid bus route 801, green squares represent MetroRapid stations. In upper left of map, note that MetroRapid route 803 (primarily serving Burnet Rd. 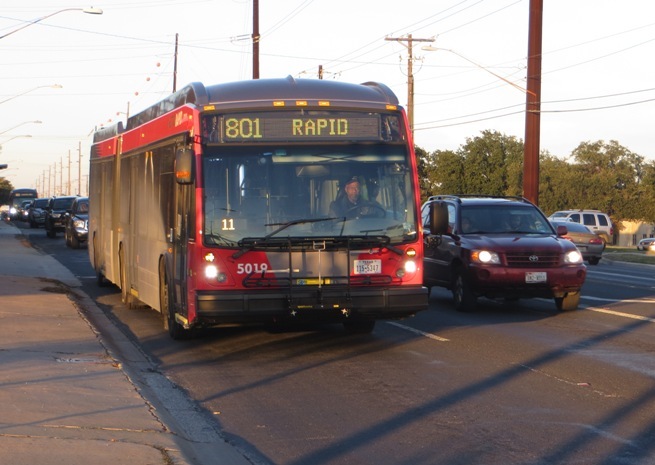 corridor) joins Guadalupe at E. 38th St. and shares route with #801 into core area. 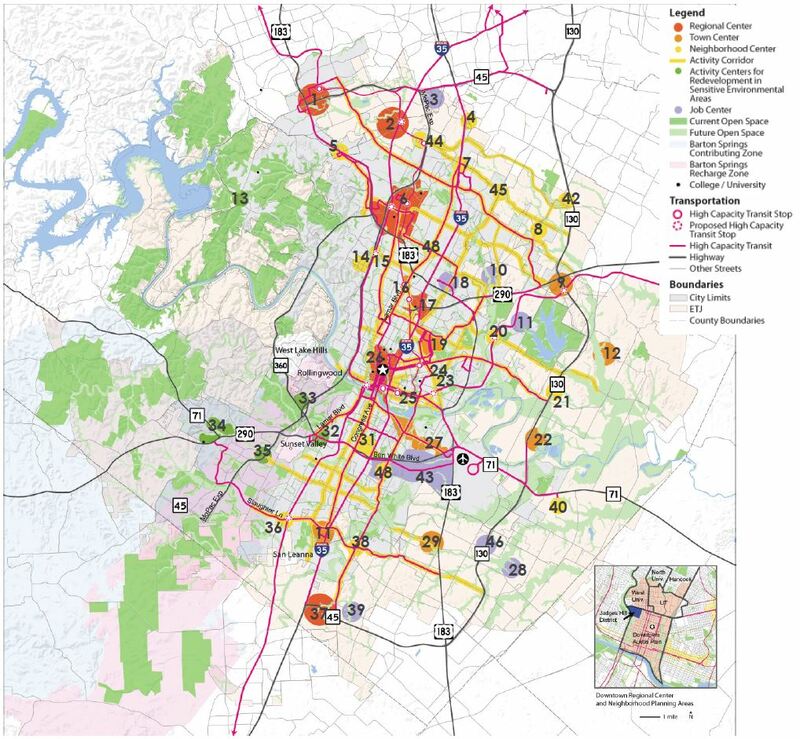 The 2000 PE/EIS recognized that most of Austin’s growth has been North and Northwest and that’s likely to continue well into the future because that is where we’ve made most of the regional infrastructure and transportation investments for decades; e.g., IH-35, Loop 1, US 183, US 183A, SH45, etc. For a host of reasons, future growth will almost surely be more clustered, more village-like with less single-family dwellings on detached lots and it will be located with access to frequent high capacity transit if (and only if) we provide for it. Though we lost that election by a half percent, the situation hasn’t changed. We still have a highly constricted, congested core fed by three main north/south arteries, only one of which is practical and affordable to meaningfully [expand] within the likely funds we can muster at this point in time. And its name is not “Highland”, it’s North Lamar. (Highland is a neighborhood bounded by North Lamar, US183, IH35 and Denson Drive and it has endorsed rail on Guadalupe/Lamar.) Even “sliced and diced”, Project Connect’s own mapbook data shows that Guadalupe/Lamar is the highest density travel corridor in Austin. Reconnecting America’s Jeff Wood, former Austinite with a UT Master’s degree on Austin’s rail history and leading authority on urban rail impacts says, “Rail line(s) extend existing market gravities, but do not create new ones … development corresponds with proximity to major employment. Ultimately, what matters is proximity to employment as to whether denser transit oriented development will happen. The major employment is along Guadalupe Lamar.” Wood bases his remarks on “Rails to Real Estate Development Patterns along Three New Transit Lines”. So Guadalupe-Lamar is the bird in our hand, so why strangle it hoping for two birds in the bush 17 years in the future? Why are we squandering our best asset based on fantasy data derived by misusing a growth model from Portland, a city with the strongest land-use laws in the country? Reinforcing what we have with a well-designed cost-effective “most bang for the buck” first phase rail line is the only way to provide the driving synergism necessary to build future support for extensions. As Moody’s recent SH130 credit downgrade so dramatically illustrates, just because you build it doesn’t mean they will come. 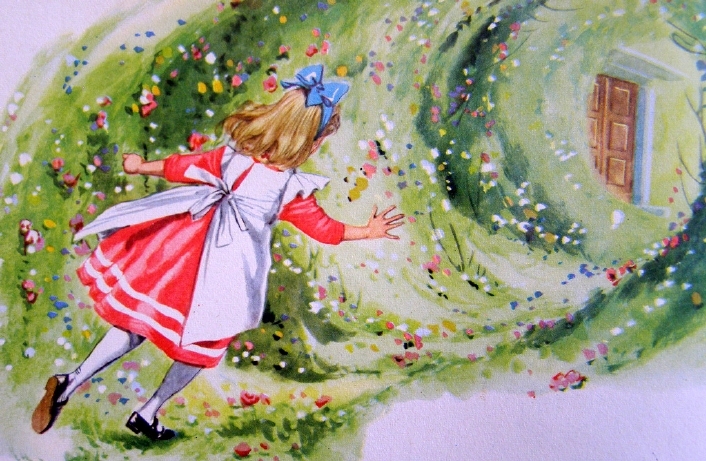 Which brings me back to where I started. Why have those in charge of the process never given TAPT’s urban rail loop plan the same hearing opportunity before decision-makers that, say, Gateway Planning received in the spring of 2012 before the TWG? We, after all, are the oldest urban rail stakeholders in the city, a Texas non-profit corporation, dedicated to promoting public transit and rail transit since 1973, drafting Austin’s first rail proposals in the early seventies, instrumental in the creation of Capital Metro in the 1980’s, playing a major role in formulating CMTA’s original service plan and whose leaders are widely recognized and known in the rail transit industry. Lyndon is a former data analyst and planner with Capital Metro and served 4 years as a board member in the early 1990’s. He was the first person (in 1975) to recognize the value and promote acquisition of the current MetroRail line from Southern Pacific in the mid 1980’s. Both Lyndon and I have served on the APTA Streetcar Subcommittee for the last seven years and we have spent countless hours researching, riding, evaluating, photographing and writing about and promoting rail transit here and abroad for last 35-40 years. Our transit professional list-serve is a constant daily source of transportation information from around the world and we know from traffic analysis that our website, www.lightrailnow.org, is heavily used by transit professionals and advocates and is highly regarded for the accuracy of its content, approximately ten thousand pages in size. Original urban rail “circulator” system in 2008 map of ROMA consulting team plan, contracted by City of Austin. 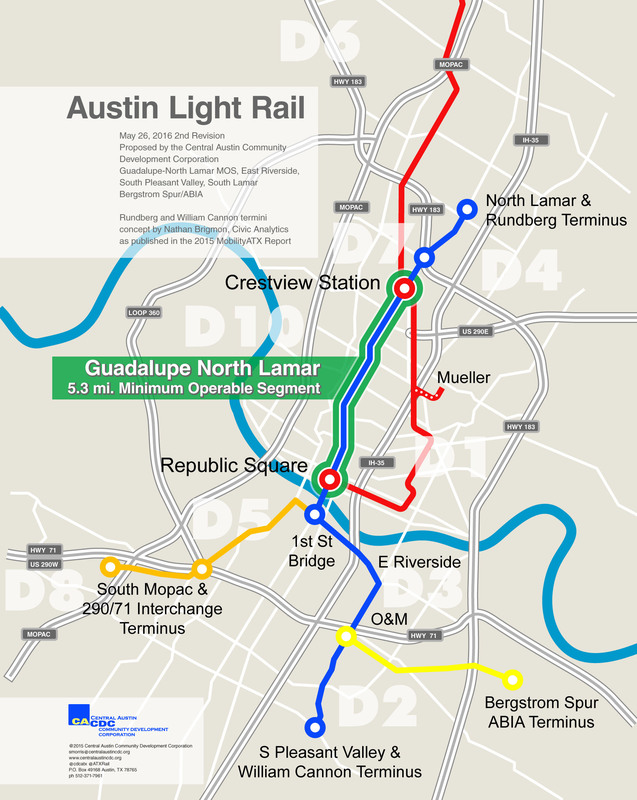 Attached, is TAPT’s urban rail loop plan in a one-page pdf that you may have seen in a simpler format on our Austin Rail Now blog. Just like the City’s plan above (Project Connect) our plan was peer-reviewed by transit professionals, people who have actually worked here in Austin on light rail projects in the past. Will Project Connect continue to gag the public? Issues of process and organizational structure can be terribly boring. But Project Connect’s efforts to eliminate or gag bona fide community participation have undoubtedly performed a major role in allowing key insiders to rig the “high-capacity transit” study process, skewing the results and allowing officials to endorse the same basic route structure they wanted in the first place. 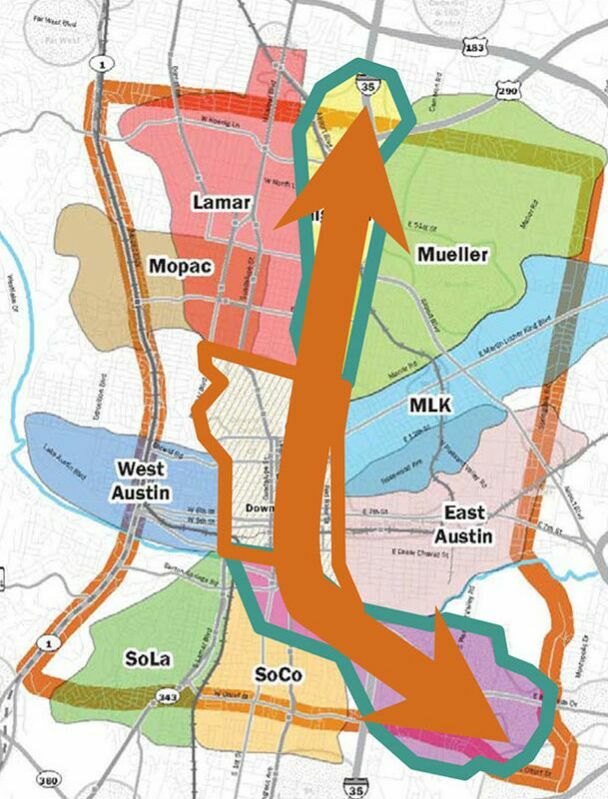 Supporters of the Central Austin “backbone” corridor (West Campus-Guadalupe-Lamar) have been outraged by the blatant corruption of a purported “study” and its procedures. • Welcome to Project Dis-connect! And, unless there’s effective community intervention to change the game, the same kind of thing could happen all over again in this upcoming “Phase 2” of the “study” (which seems more an exercise in adroitly skewing and manipulating the playing field than an actual study). Some community activists are hopeful that the so-called “Riley amendment” — a provision successfully added to the City Council’s recent endorsement of Project Connect’s “ERC-Highland” route plan — may offer an opportunity to keep the West Campus-Guadalupe-Lamar “backbone” corridor issue alive within the current Project Connect process. Dan Keshet has posted the full text of the amendment on his Austin on Your Feet blog. The City Manager is directed to work with Project Connect to identify future funding needs and potential sources to prioritize and continue critical Central Corridor project definition and development activities in the remaining identified sub-corridors, including the Lamar, Mueller, and East Austin sub-corridors, and report back to Council by August 1, 2014. While the Riley amendment may indeed be viewed as a small compromise possibly helpful to the momentum to re-focus urban rail planning on the crucial West Campus-Guadalupe-Lamar “backbone” corridor, opening the tiny crack presented by that opportunity within Project Connect’s highly rigged process will remain dauntingly difficult, especially as long as Project Connect continues to insulate itself from real community engagement, managing and muzzling community input in a caricature of authentic “public participation”. So back to “process”: Free, open, unconstrained community meetings are essential. There needs to be a groundswell of community pushback against the gagging. Project Connect needs to open up the community input process to full and free discussion, and the Austin community needs ongoing opportunities to be heard. And that doesn’t mean just handing out clickers. Lyndon Henry, technical consultant for Texas Association for Public Transportation, making presentation to CCAG on Dec. 6th. Screenshot from City of Austin video. 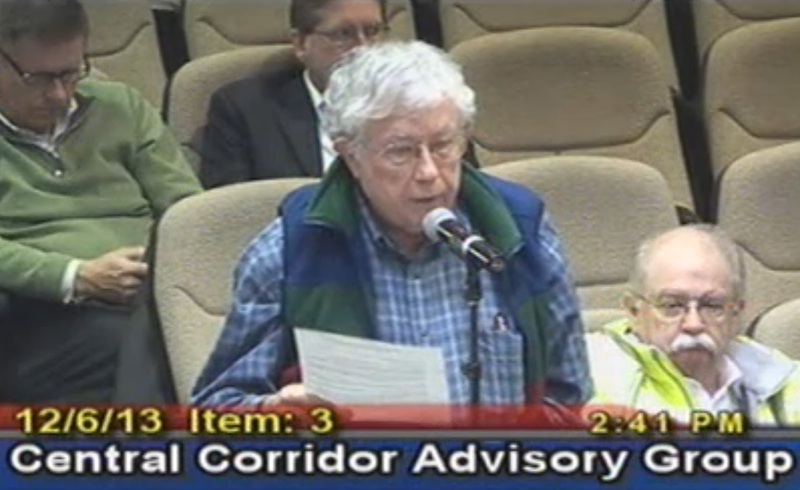 These comments were presented to the December 6th meeting of the Central Corridor Advisory Group (CCAG), just prior to their voting 14-1 to approve the official recommendation (favoring the “Highland” and “ERC” sectors for so-called “high-capacity transit” — generally perceived as camouflage-speak for urban rail). Extemporaneous verbiage included during the oral presentation has been added to the version posted here. 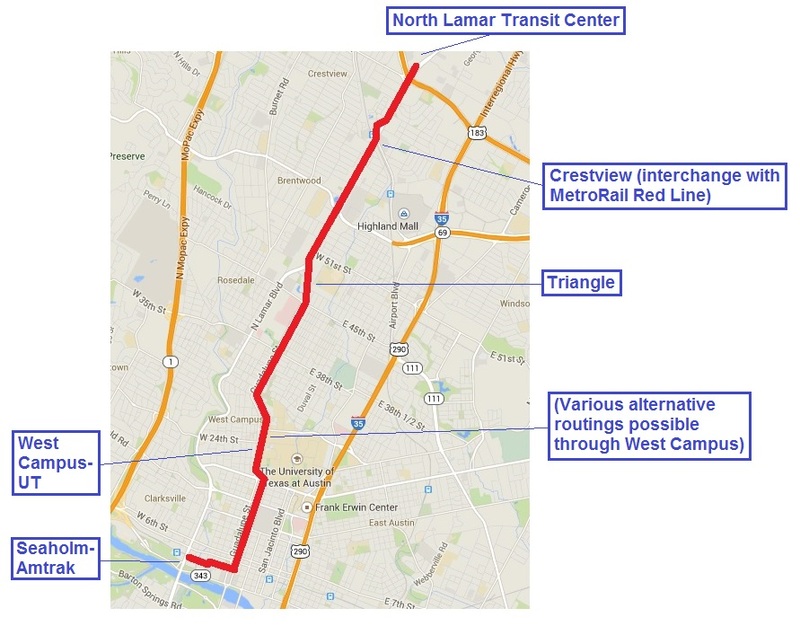 • Project Connect’s “High-Capacity Transit” study needs either to be paused and reviewed, or for Phase 2 to be expanded to include actual travel corridors in both the “Lamar” and “Mueller” sectors. • The way this study was conducted has been shameful — an unprecedented rush in a context of pressure from political officials and special interests, ignoring actual travel corridors, gerrymandering city areas for study, cherry-picking data, manipulation of data, substituting value judgements for facts, public manipulation, muzzling community input, isolation from effective community review. However it may go forward, this process needs a major overhaul. • Contradictory though it may seem, this does not mean I’m impugning the basic honesty or competency of the Project Connect team. While I do believe this study has been skewed, I continue to believe that the Project Connect personnel are fundamentally honest and competent. In my view, there’s a tragedy that good, decent, honest, competent professionals are influenced by external political pressures to make unwise decisions on crucial methodological and procedural issues. • The problems in this study are way too numerous to detail here, so I’ll just note a few of the most outrageous. 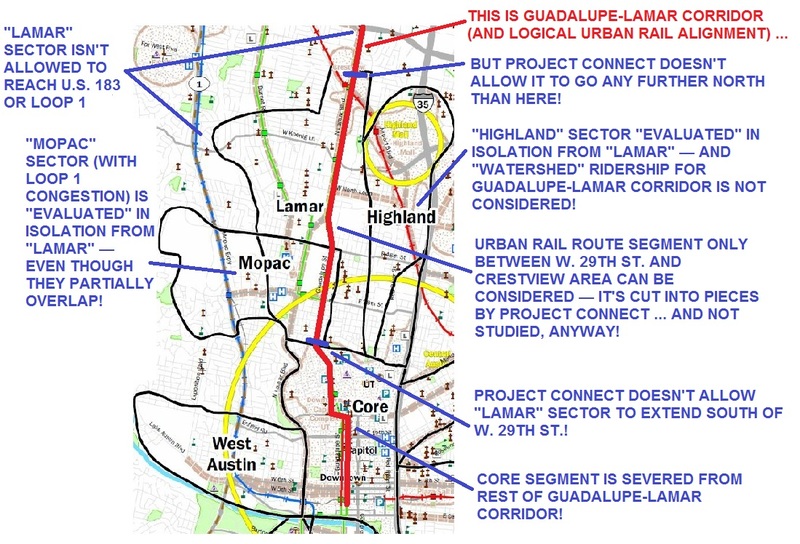 • Project Connect’s methodology segmented the outstanding Guadalupe-Lamar corridor into nonsensical pieces, severing it from its most logical destination (the West Campus and core area), thus creating an arbitrary “rump” route that goes from nowhere to nowhere. • Extremely important non-work trips such as UT student trips and recreational trips have been EXCLUDED as a measure of “Travel Demand” from each sector to the core. How could they do this in a city whose core contains the largest university in the state? • Rather than developing conservative, reliable, and plausible forecasts, Project Connect has produced exaggerated, highly questionable projections, heavily skewed toward certain geographical areas. When these same projections are plugged into Project Connect’s own Transit Orientation Index (TOI), the results are ridiculously unbelievable. For the single “ERC” sector, the low-end prediction of daily transit ridership is higher than the total system daily ridership of entire cities like Denver and Seattle. On the high end, it’s about equal to the total system daily ridership of Chicago and Philadelphia combined. Do you really expect the Austin public at large to believe these kinds of results? These shenanigans, and treatment of the community as if they were fools, have been a slap in the face to central Austin’s core neighborhoods, that have remained among urban rail’s strongest supporters, have been promised a rail line, and have spent many hours of time crafting neighborhood rail station plans. 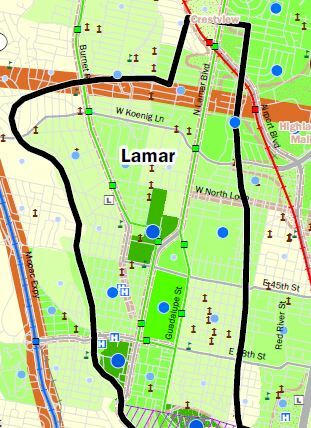 Guadalupe-Lamar remains at the heart of the city, where all the core neighborhoods are, and where a Phase 1 urban rail line should start and provide a spine or anchor for outward extensions. And it provides both the demographics and the “opportunity assets” at the least cost for doing so. I urge you to do the right thing and help to move this process in a very different direction. This Email was sent on December 5th to members of the Central Corridor Advisory Group (CCAG). While the memo indicates an assumption that Citizens Communications would be allowed at the end of the CCAG meeting, the posted agenda, in a departure from past practice, now indicates that Citizens Communications will take place in the middle of the meeting, prior to “Discussion & Action”. I am writing to urge you either to hold off voting on a recommendation on the Phase 1 urban rail project, or to recommend including the “Lamar” sector (“sub-corridor”) for further evaluation in the next phase of Project Connect’s study. 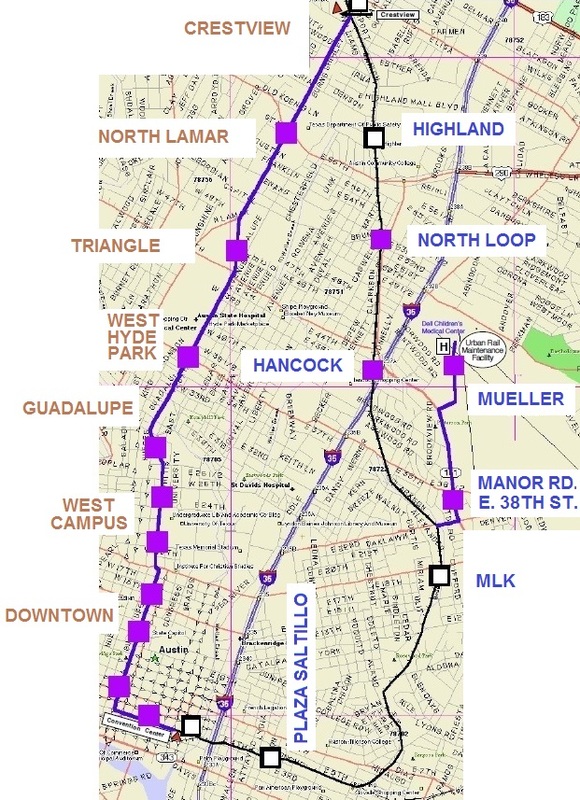 “Lamar” sector (“sub-corridor”) includes a portion of Guadalupe-Lamar corridor. Map: Project Connect. As the Project Connect team has started releasing some of their methodology and basic data, an ever-widening array of problems has become evident, and questions from the community continue to multiply. From the outset, this urban rail study (now a “High-Capacity Transit” study) has been inexplicably rushed, in clear violation of Best Practices within the transit industry and cities across the country. Even Kyle Keahey has repeatedly admitted that, ordinarily, this kind of study would require 12 to 18 months. Yet Project Connect has raced to a decision in less than five months of actual study. This is not a sound or propitious basis for rallying community and voter support behind such a major public transportation investment. This project should preferably be put on Pause; barring that, the “Lamar” sector should at least be added for further consideration. • The basic methodology of focusing on sectors (so-called”sub-corridors”) meant that the study failed to study a single actual potential travel corridor in the study area. • This methodology also segmented an otherwise viable corridor such as Guadalupe-Lamar into nonsensical pieces, severing the corridor from its most logical destination (West Campus and core area), and thus creating an arbitrary “rump” route (29th St. to south of U.S. 183) that goes from nowhere to nowhere. • As a measure of “Travel Demand” from each sector to the core, non-work trips such as UT student trips and recreational trips (e.g., to restaurants, bars, etc.) have been EXCLUDED — dismissing not only the enormous importance of non-work trips (which are heavy in the off-peak) for more cost-effective transit service, but especially the huge significance of student and recreational trips in a city with the largest university in the state (and located in its core). • Rather than developing conservative, reliable, and plausible projections, Project Connect has produced bizarrely exaggerated and highly implausible projections that are heavily skewed toward certain geographical areas such as East Riverside and the so-called “Highland” sector. • When these same projections are plugged into the Transit Orientation Index (TOI), the results are extremely implausible — e.g., for the “ERC” (East Riverside) sector, Project Connect calculates high total daily transit ridership of 2.9 million, about equal to the total citywide daily ridership of Chicago and Philadelphia combined. (Their “low estimate” for that single sector is higher than the total citywide ridership of entire cities like Denver and Seattle.) This strongly tends to corroborate other evidence that Project Connect’s projections have been seriously exaggerated and are utterly implausible. • The study has assigned an extremely high “Constrained Right-of-Way” penalty to the “Lamar” sector, but not to the “Highland”, “Mueller”, “ERC” sectors — apparently implying that Project Connect considers there to be no “Constrained Right-of-Way” problems for “Highland”, “Mueller”, and “ERC”. This also is implausible, and this penalty seems to be arbitrarily applied to sectors (“sub-corridors”) that the Project Connect team dislikes (e.g., “Lamar”), but withheld from sectors they seem to prefer (e.g., “ERC”, “Highland”, “Mueller”). In reality, “Highland”, “Mueller”, and “ERC” not only face serious problems of constrained ROW, but daunting problems of major civil works (e.g., a river bridge, grade-separations with I-35, etc.). In contrast, the Guadalupe-Lamar corridor would encounter no necessity for major civil works. The Austin public is certainly not stupid, yet Project Connect’s peculiar methods and rationales have made many in the community feel as if they’re being treated like fools. Contrary to Project Connect’s claims that their public participation process has been “robust” and “open”, it’s a serious departure from past democratic norms. This is exemplified by the fact that public communications to CCAG were opened only in the very final stages of the study process, and just the last meeting before Project Connect made its decision. And now, since Citizens Communications comes at the conclusion of your Dec. 6th meeting, speakers will not even have a chance to address your meeting until after the recommendation issue has been dealt with. Persuading the public to understand the need for urban rail in Austin, and to vote approval of bonds to fund it, will be an enormous challenge. This will be an even more difficult challenge if Project Connect persists in alienating the core neighborhoods in the heart of the central city — and West Campus and student population — by rushing to decisions based on implausible and dubious analyses, and a cavalier attitude toward bona fide community involvement. Please give your strongest consideration to either pausing this process, or including the “Lamar” sector in Phase 2 of the study process so that it can be more adequately and fairly evaluated. You are currently browsing the _______________Austin Rail Now blog archives for December, 2013.